Offer support and encouraging words as your boyfriend deals with the death of his grandfather. 1 What Do I Tell My Friend Whose Grandma Passed? 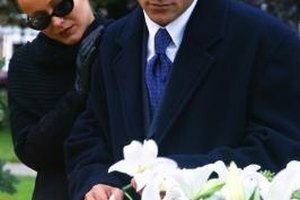 3 How Should I Act Around My Boyfriend's Family if His Grandma Passed Away & I'm Going to the Funeral? When your boyfriend's grandfather dies, you might be uncertain as to what you should do and say. Keep in mind that it's not only important to be there for him emotionally, but also to say the right things as he tries to process the news. Offer your support, choosing your words carefully to help him move forward at his own pace. It's important to acknowledge the death outright. For example, you might say, “I’m so sorry about your grandfather’s death.” Even if you are hesitant to bring up the deceased because the feelings of loss are fresh, the Life Care website stresses the importance of doing so. If you avoid saying anything about his grandfather, your boyfriend may feel alone and unable to talk about the death with you. It's not only acceptable, but also helpful to say how much you miss his grandfather and appreciate knowing him for the time that you did. If you didn’t know his grandfather, you could tell your boyfriend that when he feels ready to talk, you'd like to hear more about his grandfather. Offer to provide additional assistance with errands or other practical matter as he needs it. After the news of his grandfather's death, he may be busy planning a funeral and mourning with his family. While you may not be able to help with that process, saying that you will run to the grocery store or notify his friends about the passing will assist your boyfriend. If your boyfriend or his family asks you for help with funeral arrangements, avoid trying to tell them what is best to do, particularly if they are in disagreement with you. Because you are not family, ensure that you do not overstep your boundaries when offering your opinions and help. As you determine the best things to say during this difficult time, take a few other things into consideration. Avoid religious statements unless you are sure of your boyfriend's beliefs about death and dying. Not every religion believes in an afterlife or views death in the same manner and you don't want to say something you might later regret. In addition, never use the phrase, "It's going to be alright." Instead, only say things that you can promise like, "I will be there for you throughout this process."